Vinnie the Pooh! : Can you spot the lil' heroine? Can you spot the lil' heroine? Meet my personal photographer, fashion consultant and the very beautiful - Dia! 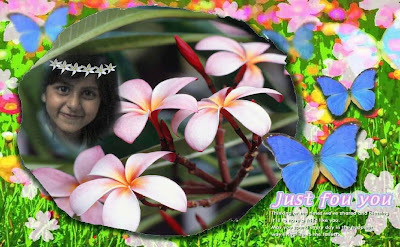 After a tiring photo shoot in the jungle, she takes a Sunday break amidst her favorites - flowers and butterflies. Post Script: I have not been threatened to put my niece's pic here on my blog post my jungle shoot. This decision is entirely my own and all opinions stating otherwise are sincerely expected to be disregarded. It's just that I also care about my joie de vivre!! One more to add...it is very clear that you were threatened, strangled whacked by that super woman in that pic...ur PS reveals everything...have u claimed insurance and still alive? for once I agree to lacelot.. tum ganga main bah kar aayee thee?? ya sadak se uthaya tha tumko ? Sen, she is saying 'thank uuuu!! main india ke paas se rehtha hun..aap singapore mein rehtha tha??? Karthk kidar mein rehtha? Chennai kidar hain ?? i'm simply falling of my chair yaar.. u n karthik's hindi - absolutely crazy! huh how dare u to tease our hindi- we were the tutors of Vajpai...all his poems were written by us...wat say Kartik?? u n Karthik are instrumental for his downfall then!! neways, i dont intend to touch private parts of sharks, not now not ever!! whats the scene at copycats?? some past is good:) Repetex english:) WOW!! The Pooh has been interviewed! The story of my experiments with Truth! Tagged - A Photo Story! Our dear Rover is in love! The God of big and small Terrorists! Jaam…aur ek nasheeli shaam, Kishore da ke naam! Can you spot Vin, the jungle queen?